The combination of sweet apple jelly and spicy mustard accents the flavor of this roasted ham with a unique savory-sweet taste. 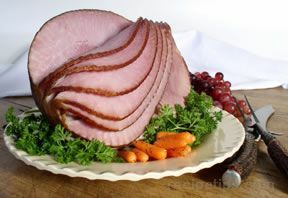 A spiral ham creates its own slices when carving the ham. While ham bakes, melt jelly in a saucepan. Whisk in remaining glaze ingredients until well blended. Cool to room temperature. 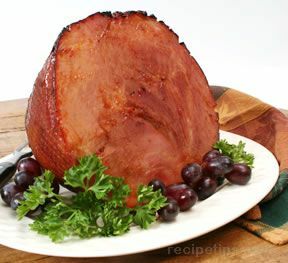 Remove ham from oven when finished and increase the temperature to 450 degrees F. Brush ham with glaze and return to oven for 7 minutes longer until glaze sets. Remove from oven and let stand approximately 10 minutes before serving. "If anyone is looking for a good ham recipe for Easter, they should try this one. I made this last year for Easter and it was excellent. We loved the glaze on it. I will be using this recipe again this year."